Abel Hotel is just a 5-minute walk from the banks of the River Allier and a 10-minute walk from Langeac Train Station. Rooms have free Wi-Fi access and a TV with satellite channels. Each room is soundproofed and also has a private bathroom with a bath or shower. Guests can enjoy a continental breakfast, which can be served in the rooms. It is possible to go fishing on the River Allier. 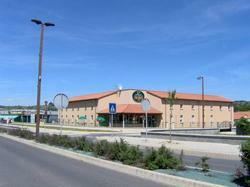 There are restaurants and cafés within a 10-minute walk and free private parking is available at the hotel. Please note that you have to send a prepayment of 30 % of total amount by cheque to confirm the booking. This double room has a minibar, flat-screen TV with satellite channels and soundproofing. This room has a large double bed, a flat-screen TV with satellite channels, a telephone and a desk. These rooms overlook the street. Each room has a flat-screen TV with satellite channels, free WiFi access and a private bathroom with a bath or shower. Each room has a flat-screen TV with satellite channels, free WiFi access and a private bathroom. This room has a shower. Each room has a flat-screen TV with satellite channels, free WiFi access and a view of the surrounding landscape. This triple room is on the groundlfoor and has a private entrance. Guests can park their car in front of the room. Each room has a flat screen TV with satellite channels, free WiFi access and a private bathroom with a bath or shower.